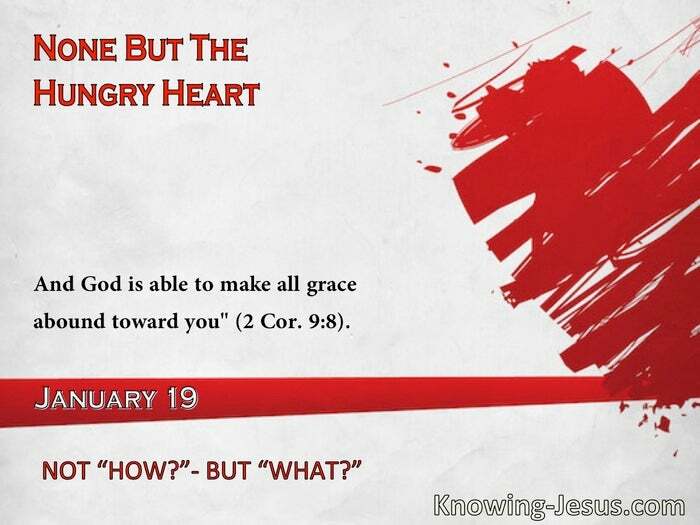 And God is able to make all grace abound toward you" (2 Cor. 9:8). Once we come to rest in the fact of what He has accomplished for us in Christ, there need be no concern as to how and when He will carry it out in our daily life. "How many a child of God remains weak and timid because, instead of being occupied with what God has promised, he is considering how it can be fulfilled. But we have nothing to do with the how; it is enough that our Father has given us His Word. Whatever, therefore, may be the nature of the suffering or trial through which we have to pass, let us ever account that God is able to fulfill all His promises. "Let nothing ever lead us to doubt the certainty of His Word, though we may be utterly at a loss to understand the manner in which He may see fit to accomplish it. We shall then be able to testify, with Joshua of old: Not one thing hath failed of all the good things which the Lord your God spake concerning you; all are come to pass unto you, and not one thing hath failed thereof' (Josh. 23:14)." -E.H.
Our Father often encourages the weak in faith by giving speedy answers to prayer; but the strong in faith will be further developed by God's delays. Delayed answers to prayer are not only trials of faith, but opportunities of honoring God by our steadfast confidence in Him." "For all the promises of God in Him are yea, and in Him Amen" (2 Cor. 1:20).